Drivers in Kalispell and Missoula now have a new option for renewing and replacing their drivers licenses. A new partnership between the state Motor Vehicles Division and AAA Montana allows AAA to process non-commercial driver license renewals and replacements at AAA offices in Kalispell and Missoula. Levi Worts is a public information officer for the MVD. "Those two transactions are the most common that we see, so by authorizing AAA to make these transactions, that should free up space on our appointment scheduler and other services that Montanans come to the drivers license station for," Worts says. AAA Montana and Montana MVD recently entered into a four-year agreement. The state isn’t paying AAA for the service, and AAA is allowed to charge people a convenience fee of up to $20 — on top of licensing fees — for license renewals and replacement. That convenience fee is waived for members. A spokesperson for the company says it hopes to expand its licensing services to Bozeman, Billings and Great Falls in 2019. "We have worked with these types of outside-the-box ideas to still provide that great service to Montanans and work within our budgeted means," says Levi Worts with the state MVD. But AAA won’t be able to help an expected surge of people seeking to update their drivers licenses to be REAL-ID compliant. The current Montana license will no longer be accepted as an adequate form of identification at airports and military bases starting October 2020. The federally-compliant cards will not be mandatory in Montana and will cost between $25 and $50 plus fees. Worts says AAA Montana offices in Kalispell and Missoula will process non-commercial license renewals and replacements while the state handles requests for REAL IDs, which become available in January. Congress passed the REAL ID Act in 2005 to standardize ID cards across states in response to recommendations from the 9/11 Commission. In September the MVD launched a new website in partnership with Montana State University-Billings featuring an interactive chat-bot to answer questions about the new identification cards and book appointments. Montana will start issuing identification cards that comply with the federal REAL ID Act in January. A new state website is available now for people who want to book an appointment to get the federally approved ID card. Starting in October 2020, a regular Montana state drivers license will no longer be adequate identification to board flights within the United States or gain access to federal facilities like military bases. The federal government gave Montana a one-year extension to comply with the REAL ID law. Without it, Montanans could not board a commercial airplane or enter federal buildings after January 22, 2018 using their driver’s license. The alternative was another federally issued identification, like a passport. The Department of Homeland Security had said it would only grant Montana an extension was if the state made a commitment toward making substantial and documented progress toward complying with REAL ID. 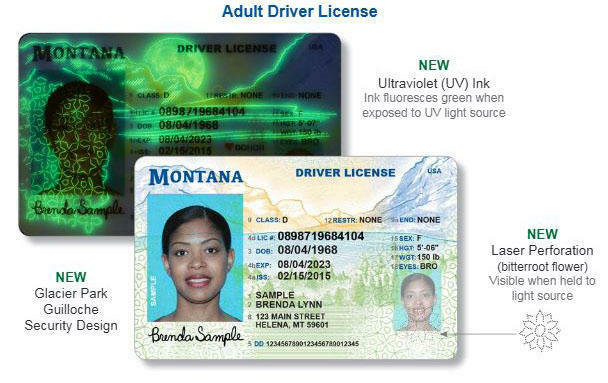 Montana’s Motor Vehicle Division announced today it is rolling out newly designed driver's license and ID cards.